Sources close to Google and familiar with their future plans have stated that Google are certainly moving to have an ad blocker feature turned on in their browser by default. Google could announce the feature within weeks, but it is still ironing out specific details and still could decide not to move ahead with the plan, the contact said. 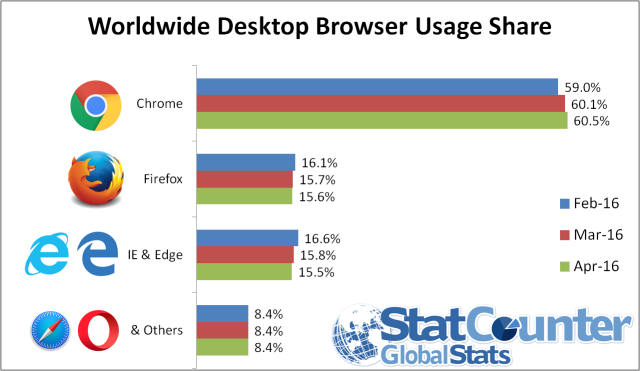 The news of the ad blocker was worrying to some as Google’s Chrome Browser holds roughly 60% market share when it comes to browsers and the fallout could be enormous for some publishers if they move ahead. This feature differs to the AdBlockers we know (and sometimes love) that have been circulating for awhile now as this isn’t about simply removing all ads from the browsing experience. Experience being the key word here as they aim to filter out certain online ad types deemed to provide “bad experiences” for users as they move around the web. We’ve all seen these ads before, popping up and taking over the screen right as you’re reading content or looking through products on site. They’re jarring and in most cases annoying when you are attempting to consume content. So many could argue that removing these types of ad formats is a good thing. Though there are conflicting reports on how exactly Google’s system would work, it won’t automatically block all ads like the popular Adblockers do and a curation system is put in place where consumers opt to block certain advertisers or websites. A possible application is they may choose to block all advertising that appears on sites with offending ads, instead of the individual offending ads themselves. In other words, site owners may be required to ensure all of their ads meet the standards, or could see all advertising across their sites blocked in Chrome. So when one of the largest advertising companies in the world are now in charge of the ads you see, does this begin an anti-trust issue? Whilst there are many reactions around the web on this built in adblocker, some have been asking the question of antitrust. It is highly unlikely that Google will consider it’s own ads to be the “bad ones” and filters out others perceived as “bad” in it’s own browser at least raises eyebrows about antitrust issues. The torrent of court cases we will likely see within days of its release by AdTech firms will surely have a strong argument that this is anti-competitive and a move to suppress competing advertising firms. 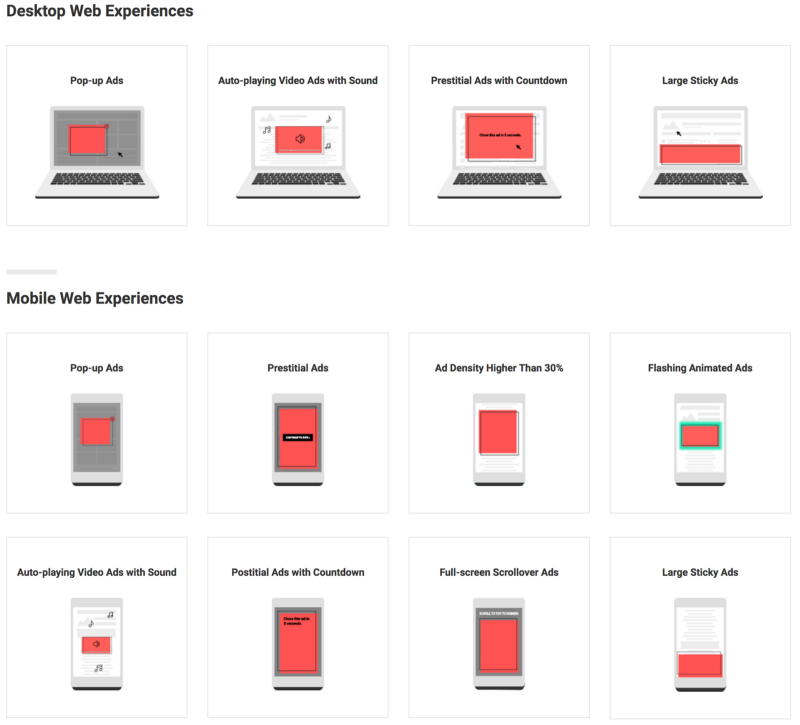 Google’s key defense here (and not unreasonably so) is that people hate ads and a system put in place to remove those that lessen the user experience is a good thing and Chrome and other browsers have had a form of ad blocker for some time already in that they block pop up/pop under ads. The ad-blocking step may seem counter-intuitive given Google’s reliance on online advertising revenue, but the move is a defensive one. Uptake of online ad blocking tools has grown rapidly in recent years, the most popular being AdBlock Plus which is currently at about 300 million downloads and more than 50 million monthly active users. Generating over sixty billion in revenue from online advertising in 2016, the growth of ad-blocking is a worrying trend for Google and a concern for other publishers and services that rely on advertising revenue to support their businesses. By switching on its own ad-filter, Google is hoping to quell further growth of blocking tools offered by third-party companies, some of which charge fees in exchange for letting ads pass through their filters — this in itself facing criticism as a form of extortion to adtech companies with Google, Amazon, Microsoft, and Taboola among those who have paid up. With Chrome accounting for such a large portion of web browsing globally, switching on and controlling ad-filters within it gives back the control to Google. If slow-loading websites, inaccessible content, and cluttered webpages that have made many people hate online advertising is addressed then the move could actually be a blessing for the industry and the user. What does it mean for affiliates? Affiliates that rely too heavily on pop-ups and other low quality promotional methods may be considered the low hanging fruit on the roll-out of this update and may be hit the hardest. Banner of ad farms are likely to be blocked and rightly so, they offer very little in the way of quality and experience and a remnant of a different time when such practices would and could rank in SERP’s. Generally speaking affiliates that are promoting in a manner that adds to the user experience and adds value in general should not be affected unless they engage in practices such as pop-ups on desktop and web and moving to native, in-content and banners can ensure a longer term business strategy — until Google changes the goal posts once again. Black Friday 2018 saw more participation and excitement than any other year, the penny has finally dropped on this annual retail event. 25 people, 12 countries and 9 languages. With over 20 dishes, it was a delicious way to celebrate our workplace diversity with our inaugural Multicultural Day at Commission Factory HQ. On Tuesday the 11th of September Commission Factory celebrated the opening of our new office on Martin Place - the heart of the Sydney CBD.